This street is located in Winnipeg, Manitoba. 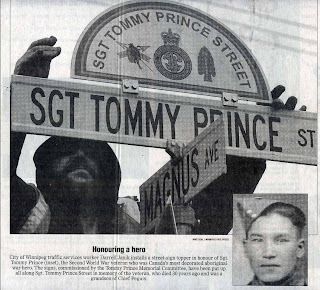 We owe a vote of thanks to Don Mackay CD of Winnipeg for his hard work and dedication to Sgt Tommy Prince MM. Don you have done this old soldier justice and we all thank you. 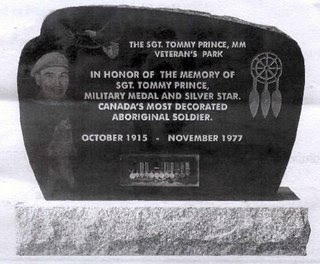 Please note Tommy is not the most decorated aboriginal soldier in Canada. We can maybe safely say the most decorated aboriginal soldier in Manitoba but not Canada. 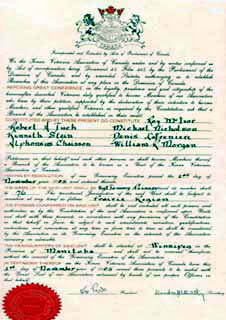 This charter was issued to Unit 76 in Nov of 2005 and their home unit is the #4 Royal Canadian Legion St James Branch Located at 1755 Portage Ave Winnipeg, Manitoba. Pictured above are the flags of the Korea Veterans Association the Sgt Tommy Prince MM Memorial Unit 76. 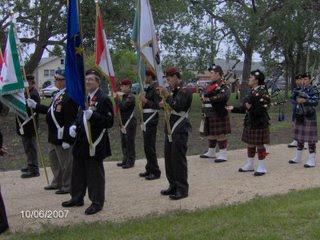 The unit works out of their home Unit #4 Royal Canadian Legion Winnipeg, Manitoba. 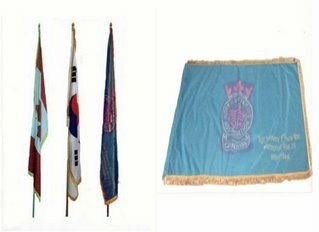 These flags were obtained through donations and the sales of clocks by members of the Korea Veterans Associations of Canada and we thank them for helping us out. The unit meets once a month, usually at lunch time on the last Wednesday of the month at #4 Royal Canadian Legion, 1755 Portage Ave. There is no dress code for meetings and they are usually informal. If you know a Korea Veteran who may want to join the association it is never too late. You can drop into #4 RCL and they will pass on an application form to you. Thank you for reading this and looking at my blog, for more info on the Tommy Prince MM KVA Unit 76 go to http://www.normsmedalmounting.com/ here you will find application forms that can be downloaded and the Unit, By-laws to give you an understanding of the purpose and goals of the Korea Veterans Association of Canada. 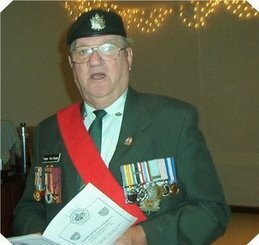 President - Roy L McIvor PPCLI, (Presently in Hospital recovring from a stroke) Vice Pres Robert A Tuck RCHA (acting as President during Roy's recovery period), Austin Bradley RCR, Membership Chairman Dennis LaFreniere and Sgt At Arms Al Chaisson RCHA. Meetings are held the last Wednesday of the month, location #4 RCL 1755 Portage Ave. Lunch meet at 1130 a.m., meeting starts 12 noon.